Editor's note: Michael Connelly came across the Ani Ashekian case while researching "Nine Dragons," which is #3 on this week's New York Times Bestsellers list. Los Angeles, California (CNN) -- The saying goes that life imitates art. But that's the last thing you want when you write crime fiction. You never want to see the things you write about mirrored back to you in real life. But a month ago as I prepared to publish and promote my latest detective novel, "Nine Dragons," I learned of a true mystery with eerie similarities and connections to my story and my research. It has been a heart-tugging reminder that while crime novels may be entertaining thrill rides and puzzles, they also skirt the shores of reality for many. Before writing novels I worked as a police and crime reporter in Los Angeles. What I saw and wrote about back then became the grist of my fiction. In that case, art imitating life. I took real stories -- a daring bank heist, a conversation with a killer, the unsolved murder of a sports agent found in the trunk of his Rolls Royce -- and turned them into fictionalized investigations in which my fictional hero, Detective Harry Bosch, always won the day. That was fine. That worked. What was done was done and I could bend the truth and make the story my own in fiction. I think that is the crime novelist's job, to take inspiration from the real world and to turn it back as something that entertains, puzzles and maybe -- if you're good -- even reflects the world back at the reader. To me, there is an art in that. But this time things have gone the other way. In "Nine Dragons," Harry Bosch is working a murder case in Los Angeles when he gets word that his young daughter has disappeared in Hong Kong. It's every father's nightmare. Harry drops everything, including his case, and flies to Hong Kong to find her. 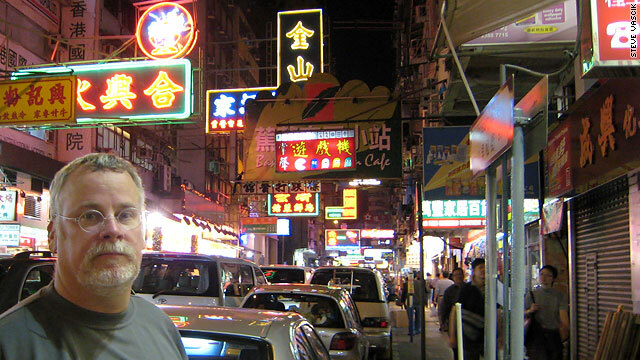 He traces her last known location to a spot in the Tsim Sha Tsui neighborhood of Kowloon called Chungking Mansions. After that point, she has vanished. Chungking Mansions is a well-known place to many travelers to Asia. It is sort of a modern Casablanca, a crossroads of the world. It is several cut-rate hotels housed in one large and old building, and all of it above a world bazaar where dozens of languages are spoken, and food and other comfort items from almost any country in Asia can be found and purchased. It is the kind of place where Harry Bosch checks his back repeatedly as he walks through. It is also the kind of place where I checked my back repeatedly when I walked through while researching the book. This was because I had a camera behind me. Last November I went to Hong Kong and visited Chungking Mansions repeatedly as I made a final research journey while writing the book. Filmmaker Terrill Lee Lankford went with me so he could document my research of the places that would be in the novel. This was so I could refer to video while writing about Hong Kong once I returned home. It was also so he could make small films that could be used to document and promote the book when it was published. While crime novels may be entertaining thrill rides and puzzles, they also skirt the shores of reality for many. This is where the real life mystery entered my seemingly harmless world of crime fiction. I live in Florida and Lankford lives in California. As he put together short films on my visit to Hong Kong, he used YouTube to privately send me rough edits over the Internet. Lankford noticed that YouTube had connected his films by subject matter to another film about Hong Kong and Chungking Mansions. I took a look and the troubling connection between fact and fiction began. The other film was about the disappearance of 31-year-old Canadian tourist Ani Ashekian from Hong Kong, and more specifically Chungking Mansions. What's more is that Ani's last sighting was on November 10, 2008, just two days before I arrived in Hong Kong and visited Chungking Mansions myself. In the details the stories are quite different. Ani Ashekian was a veteran traveler who enjoyed solo journeys from Toronto, Canada. She came to Hong Kong after visiting mainland China and stayed in a hotel at the Chungking Mansions. In Nine Dragons, Bosch's daughter is only 13 and a whole different set of circumstances take her to the same building. But the crossroads of fiction and reality still leaves a pit in my stomach. Nobody really gets hurt or vanishes for good in fiction. But it's been almost a year now and nobody has heard from Ani. Her passport and credit cards have not been used. The very last sighting of her is on November 10 on an ATM camera in Causeway Bay across the harbor from Kowloon. The very last communication is a text she sent to her niece in Toronto on the same day. She offered Happy Birthday wishes. Thinking that maybe she was still at Chungking Mansions on November 12 when I got there, I have repeatedly looked at the video taken over two days by Lankford. There are hundreds of faces moving in and out of the camera's frame, but none appear to be Ani. Whatever happened may have already happened by then. The police in Hong Kong have been investigating the disappearance. So too have private investigators, a veteran reporter for the South China Morning Post, as well as Ani's family. But nobody has moved the mystery past that ATM photo. Her journey was supposed to end on December 15 with her return to Toronto from India. She never made it to India or back home. Ani has vanished without anything to go on. And that's where this gets to me. In crime fiction, there is always something to go on. When Harry Bosch's daughter disappears, he finds a clue at Chungking Mansions and the case moves on. He is a relentless father who will stop at nothing to find her. But in real life it doesn't always happen that way. You can't be relentless with nothing to go on. Sometimes there is no direction and no answers and families and other loved ones are left with an unabated dread that hollows out their lives. Still, with stories like the recent rescue of the long ago abducted Jaycee Dugard in the news, nobody gives up hope. Sometimes hope is all that is left. I remember this from my days as a reporter -- that hollow dread and desperate hope I could read in the eyes of some of the people I interviewed -- and I thought I had left it all behind for the comfortable confines of fiction. Sometimes it doesn't work out that way. Now when I think back on my research trip to Hong Kong, I think of the young woman from Toronto who visited the same place and never returned home.